What kind of work are you doing currently? I’m working with an organization, Invest India, under the DIPP (Department of Industrial Policy & Promotion), Ministry of Commerce, a semi-governmental organization. We work on projects involving – infrastructure, energy, power plants, dams and facilitate foreign investment towards existing projects in India. It involves market analysis, handling and understanding legal aspects and enabling an inter-departmental understanding with the eventual goal of advising people on investing in these projects. Before this, I worked with Rajeev Satal, an MP from Maharashtra. I was part of the LAMP fellowship (Legislative Assistant to Member of Parliament). It’s a fellowship where we’re allotted to 50 different MPs, which has a very rigorous selection process. We work across 3 parliamentary sessions, primarily doing legislative work (raising issues in parliament, participating in debates). My role involved researching for what the MP would speak about, drafting speeches and fully understanding the rules and regulations of the parliament. My MP was posted in Saurashtra during the recent Gujarat elections, and I had the opportunity to travel to all 45 constituencies and gain a close understanding of booth management. Before this, I was working at Robert Bosch in their electric and hybrid vehicles wing as a system engineer. I used to simulate the running of the vehicle in different conditions, mostly using MATLAB. Could you tell us more about your decision to join the Young India Fellowship? In 16-17, I was a part of the YIF. I studied a very wide range of subjects ranging from economics, history, art, philosophy, culture, physics and statistics. It acts a trigger for you to learn more about the things around you. It facilitates a starting point for your knowledge, spurred on by your enthusiasm to read and learn. I chose this because I always had an interest in policy, economics, history, law etc. Engineering is so immersive, I wanted an avenue to think beyond it. I needed to accrue multi-disciplinary skills to enable me to look at problems in different ways. It was academic, very well taught with some amazing professors. It was very useful because it involved ELM (Experience Learning Model) – an internship done through the course. I was involved with a think tank of the BJP here – my role was to understand the last 5 elections in terms of numbers, an analysis of results understood through statistics. Also a little on your Harvard course on Business Administration? Harvard came up with this pre-MBA kind of course for Economics for Managers, Financial Accounting and Data Analytics. We are taught the important basics in these subjects and are finally tested by means of an online exam. Did this course help in your current job? It did teach me the basics. I haven’t applied a lot of what I learnt there yet, but the material is very useful, especially the data analytics part of the course. Statistics is very important in policy. I was very aware of what I wanted to do when I made the career switch, it was not only because my current job wasn’t interesting enough. What are the qualities that YIF looks for? There are no specific qualities that they look for. They just need you to be open-minded about learning new things. It emphasizes that learning is a continuous process and you keep leveraging what you’ve learnt before in things you’d be learning in the future. Did your experience in the student council help you? Yes, it did help a lot. Working in the student council involved a lot interaction with people – be it students, faculty, deans, director or guests. The responsibility of making important decisions for the student community and considering its long term implications was very enriching. Being able to communicate with such a diverse set of people and do what was within my capacity to help them was very satisfying. What exactly is the role of engineering in public policy? Most engineering students do not spend much time understanding the liberal arts, economics or anything that isn’t engineering. Being a part of teams in college gives us a much needed peek into a lot of things that we can’t learn in a book. College should have more avenues to discuss things like economics, policy and discuss current affairs. The entire political scene right now involves a lot of opinions and a lot of information. Most major political parties need a way to understand the requirements of their constituents to better be able to serve them. There are numbers everywhere, and there is a strong requirement of sophisticated data analytics to be able to interpret these numbers in a way that would be useful. I’m sure we’ll see many young professionals with a strong math base come up with innovative models to process this data and make interpretations that make the process of governing easier and more efficient. I believe we as engineers have a unique opportunity to create a niche for ourselves in the policy space in the near future. Are there any courses or internships that can be done at the UG level to pursue a career in public policy? How does one start a career in this field? There are a lot of courses in public policy that are offered. Takshashila offers a course in public policy. Interning with public policy think tanks could also help, like at CPR (Centre for Policy Research), CSDS (Centre for the Study of Developing Societies) or even PRS Legislative Research, which conducted the LAMP fellowship I was a part of. YLAC (Young Leaders of Active Citizenship) is another organization that conducts policy bootcamps. 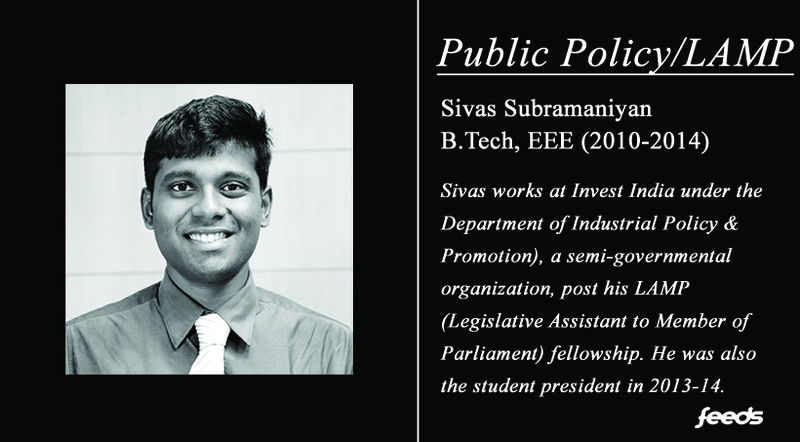 A number of MPs in the parliament hire research scholars to perform their back-end research. Their job would be to prepare background and enable the minister to be well informed to talk about a specific issue. Every political party in the country runs its own think tanks, I’m sure they’d be willing to take in undergraduate students for internships. You just need to network with people, mail them and reach out. Policy in India is highly unexplored. There is a huge want of talent in the policy space. Most of us who graduate from college are looking to either work or get another degree and join some industry with the aim of earning more money. Policy and policy research in India is waiting to be transformed. It is becoming more and more scientific. There is a certain organization and a systematic approach towards policy now. I believe this career enables me to add more meaning to democracy itself. Can one do an MBA and get into this field? Why not? There are so many engineering graduates who have done their MBAs in IIMs and other colleges and later become political consultants. It isn’t all that common, but it’s not unprecedented either, you can always find people with such a background. This is not just restricted for MBAs. The DoPT (Department of Personnel and Training) who are the ones conducting the UPSC examinations are now also opening for technical consultants, including engineers. They’re looking for people with this nuanced expertise to apply for Joint Secretary posts, usually reserved just for IAS officers. Is there something more that the T&P should do for students? The limitation of the placement cell (specific to my career) is that they feel the policy space is very unexplored. There is a certain risk towards job security. If the T&P is willing to take that risk, I’m sure there are so many consultancies that would be willing to hire someone from NITT. The mood that surrounds politics today is very discouraging. How do you avoid getting demotivated? There is a certain presumption of prejudice loaded in the question that the existing system is not running properly. We really need to question where we get our news from. We can’t get all our news from a single source because I don’t think there’s any news that’s devoid of a political flavour. Any issue we come across, we should make sure we explore it in its entirety. Read as much as possible before forming an opinion on anything. What made you realize that you’ve made the correct decision in changing your career path? This question kind of assumes that I’ve already made the right decision. I’m still exploring my options and seeing where they take me. It takes time to figure this out, it is up to me to explore and gauge my other available options and grow in a career which will be able to service both my engineering and policy backgrounds. There is no set formula to pursue this career path, and that is something we’re not used to as an engineer. It involved a lot of reading, networking and personal effort to realize what I liked and what I didn’t, and I feel right now I’m at a happy place.